Situated 80km from the province of Surat Thani, the island of Koh Samui has become a destination of choice for discerning travellers the world over. As both a cosmopolitan melting pot and an idyllic setting, Ko Samui has been in the tourism business longer than perhaps any other Thai island, yet it has managed to preserve much of the beauty that first brought people to its shores. Times have altered the island – not always for the better – but its subsequent development, much of which was born of tourism, means there is much for travellers to enjoy. Referred to by locals as Samui, the population of the island at last count was barely above 50,000; a number that is spread over an area of less than 230sq km. Koh Samui has been home to a strong, vibrant community for an estimated 15 centuries and, up until the tourism boom of the 1980s, its economy relied almost entirely on agriculture. However, what it lacks in size it makes up for in natural resources, whether they be coral reefs or pristine, sprawling beaches. Koh Samui last year reached a high point, at least as far as tourism numbers were concerned, and now the industry’s impressive showing looks set to continue in 2016. As a result, expectations are high and rising occupancy rates have been put forward as proof that the island economy is headed for a bright future. New hotels are continually cropping up, and the island’s infrastructural capacities have improved immeasurably in order to accommodate an influx of international tourists. One of the more notable items in Koh Samui’s growth story is The Library, a boutique design hotel created with a view to raising the bar of what’s expected of the island economy. Designed with the help of Tirawan Songsawat, the elegant yet provocative beachfront hotel is home to a wide array of artistic spaces, guaranteed to appease those with an eye for design. Singled out time and again for its attention to detail and minimalist charm, The Library is surely one of the must-see sites in a must-see destination. One feature for which the hotel is well known is its signature pool, which boasts bright red waters and faces out onto one of the island’s best beaches. 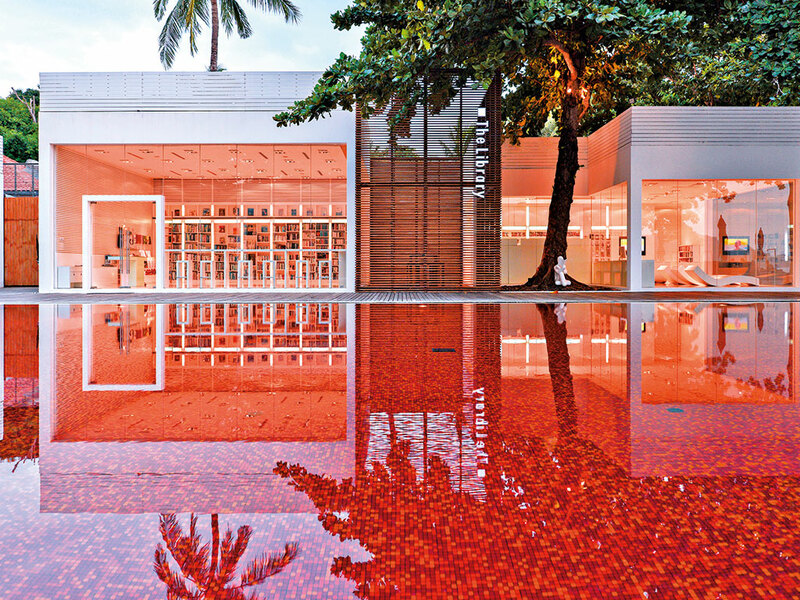 “The Red Pool, with its mosaic tiles of orange, yellow and deep red, presents a dazzling spectacle of brilliant color and sophisticated style”, the site continues. The pool has picked up numerous accolades for its individuality – as has the hotel itself, for that matter – and has earned the establishment stellar reviews from the media and guests alike. The Library’s rooms are among Koh Samui’s most luxurious, and each of them contain all manner of modern and minimalistic details that are designed to enhance any stay. The Bookmark suite, for example, offers a triple king-size bed, an open-air living room, an indoor covered Jacuzzi and its own garden, which is complete with deck chairs and glimpses of the sea. 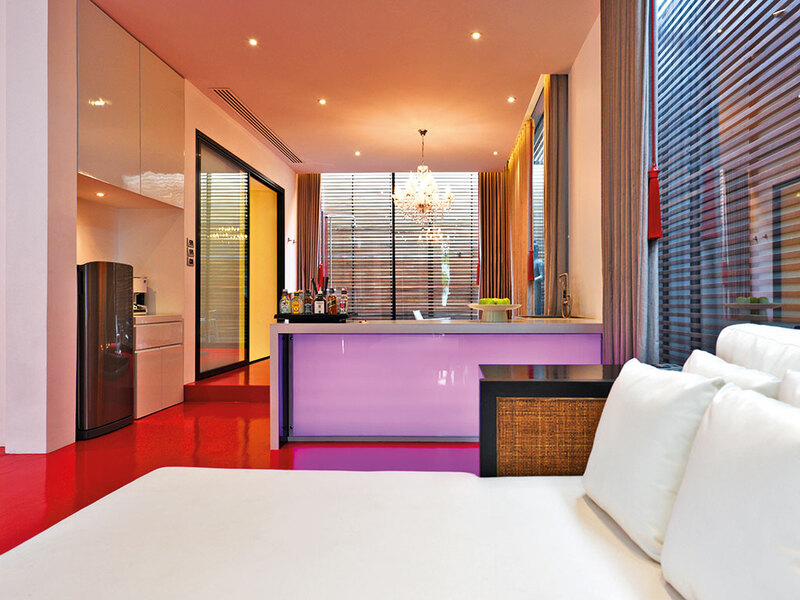 This, alongside the hotel’s 2-Bedroom Suite, Exotic Suite and Smart Studio – the hotel’s most economic option, which still offers a private terrace and its own iMac computer – are sure to suit any taste.